The Electricity Regulation Act 1999, as amended, makes it mandatory for a Registered Electrical Contractor (REC) to issue a Completion Certificate for all electrical works (excluding minor works). If a REC carries out minor electrical works they must be certified if requested by the customer. Completion Certificates are supplied to RECs by Safe Electric in line with Chapter 63 of the National Rules for Electrical Installations (see Price List and Order Form). It is through this certification system that Safe Electric, can monitor and validate that the electrical works completed meet the required safety standards. The REC will issue the original white copy of the Completion Certificate to the person responsible for the electrical installation (electricity consumer). Only the REC’s named Qualified Certifier (QC) can certify electrical works on behalf of the REC. Certificate No. 1 (paper based) (<50 kVA): Completion Certificate for the connection of new electrical installations (less than 50kVA) to the Distribution System Operator (DSO) Network. 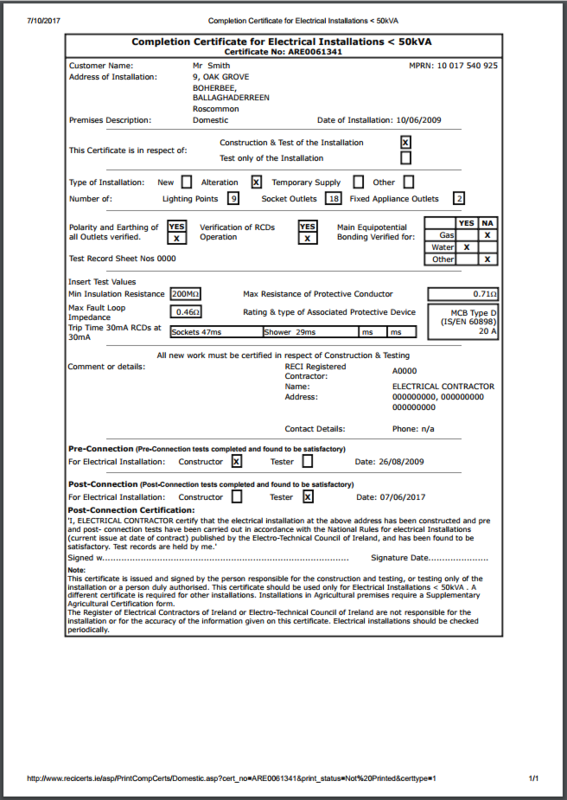 A sample for an Electronic Certificate No. 1 is available here. Certificate No. 2 (paper based) (≥50 kVA): Completion Certificate for the connection of new electrical installations (greater than or equal to 50kVA) to the DSO Network. 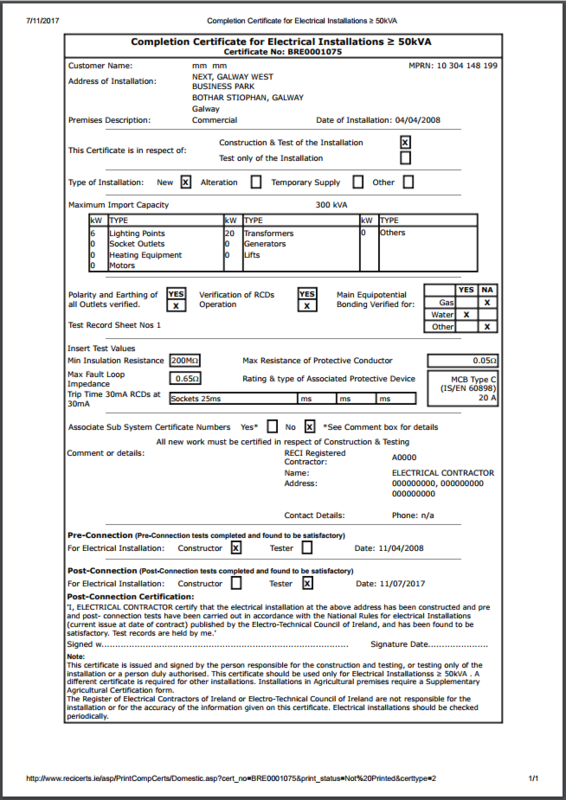 A sample for an Electronic Certificate No. 2 is available here. Note: For Certificate No. 1s & No. 2s a copy of the Pre-Connection Certificate (with the pre-connection tests completed) shall be submitted to Safe Electric for validation and processing. This will enable the connection point to be energised by the DSO. Once energised, the REC is required to submit the Post-Connection Certificate to Safe Electric (with the post-connection tests completed and verified). Certificate No. 3: The non-DSO certificate covers alterations (including additions and extensions) to existing installations. Certificate No. 3 is to be used in accordance with the CER requirements which include specific Controlled Works 2, 3, or 4, new works to an existing installation, alterations, replacement of accessories, subsystems and Minor Works (if requested by the customer). Note: Controlled Works No. 1 is not included in Certificate No. 3 as it cannot be used to obtain a connection or a re-connection of the electrical supply from the DSO. Agricultural Certificate: All electrical works in agricultural locations must comply with the National Rules for Electrical Installations, specifically Section 705 – Electrical Installations for Agricultural and Horticultural premises. A copy of the Agricultural Completion Certificate may be required by the Department of Agriculture for agricultural buildings grant-aid. Interim electrical installations (≥50kVA): Interim Certificates are validated by Safe Electric to enable the main distribution board in an industrial or commercial installation to be energised so that a completed subsystem e.g. a lift system, or a standalone module, can be tested or commissioned. In this example the REC would place locks on the distribution board for all other circuits not completed and tested. Please refer to clause 63.3.1 in the National Rules for Electrical Installations – Fourth Edition ET 101: 2008.